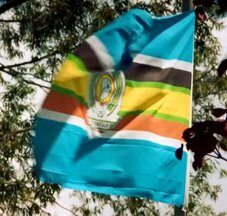 The new East African flag was seen for the first time on the 9 June during celebrations in Uganda. Ugandan president Museveni called it "a sign that we are working together for closer East African Cooperation." The flag is described as typical of most African flags, overdone, with much detail, and in the middle is a little map of Uganda, Kenya, Tanzania, surrounded by several items. The flag was the result of a competition, and the product is a mishmash of the three flags of Uganda, Tanzania and Kenya and the little map, on a blue background. Submitted by Mark Sensen, May 1999, précised by Rob Raeside, 30 May 1999. The presidents of Kenya, Uganda and Tanzania agreed yesterday (01 May 1997) to abolish double taxation for their nationals and to establish an East African passport and flag. ...... The agreement comes into effect after publication in the three countries' official gazettes. ...... The new flag, a combination of the three countries' national colours, is a symbol of the new East Africa co-operation arrangement. The flag comprises 9 horizontal stripes of unequal width. The first and last are the thickest and are in blue. A thinner white stripe separates the blue from a black stripe and red stripe at the top and bottom of the flag. These stripes in turn are separated by a thin green stripe from the middle, thicker, yellow stripe. The colour order of the stripes is therefore: blue, white, black, green, yellow, green, red, white and blue. In the centre of the flag in the middle of the yellow stripe (extending across the green and into the black and red stripes) is the badge of the new EAC. I will try and describe it for you - In the centre is a map of the three countries (Tanzania, Uganda and Kenya) which is surrounded by a cog wheel which in turn is surrounded by a green garland at the top of which are the letters EAC in Black and below are two hands clasped together (in white). Surrounding this is another black and white circular band and the motto "USHIRIKIANO WA AFRIKA MASHARIKI" at the base. The letters are in black on a white background. Sorry, can't translate the motto and no meaning provided. The motto "USHIRIKIANO WA AFRIKA MASHARIKI" means UNITY OF EAST AFRICA in Swahili. ARUSHA, Tanzania (AP) - The presidents of Tanzania, Uganda and Kenya launched a new East African Community on Monday, reviving a regional partnership that collapsed 23 years ago amid bitter disagreements over how modern African states should develop. Newspaper reports also say there is a flag which has been raised. The newly inaugurated East African Community replaces that which existed between the three countries prior to 1972 and intends to establish a customs union, regional court, legislative assembly and eventually, a political federation. A flag (as shown above) was made by a South African flag manufacturer in 1997. I was watching the BBC program "Top Gear" (S19E07) earlier this week, and I saw an interesting flag that I didn't recognize. It is shown flying at the Uganda-Rwanda border crossing in Cyanika. I was going to ask for help with identifying it, but I found that it is the Flag of the East African Community. There's also some interesting, but incorrect flag protocol at the end of the episode. After discovering what they believe is the true source of the Nile River, the "Top Gear" hosts pose in front of it to take a photograph like Victorian Era explorers. First, James May asks if the "Top Gear" flag is slightly larger than the Union Flag. Jeremy Clarkson states that it is larger, and asks May if that's correct. May replies that it is. Next, May asks, "have got this the right way up this time so we don't get [letters from viewers]?" Clarkson doesn't reply, but if you look carefully you can see the Union Flag is upside down. The East African High Commission used a green over blue flag with several thin lines in between: white, black, green, yellow, green, red, white. That made the flag look like a green-white-blue tricolour with several thin stripes in the white. The ratios of the stripes would be approximately 7:1:1:1:1:1:1:1:7 green, white, black, green, yellow, green, red, white, blue. Three red five-pointed stars are in upper hoist corner, arranged one under two. Inter-territorial co-operation between Kenya, Uganda and Tanzania was first formalised in1948 by the East African High Commission. This provided a customs union, a common external tariff, currency and postage; and also dealt with common services in transport and communications, research and education. Following independence, these integrated activities were reconstituted and the High Commission was replaced by the East African Common Services Organisation, which many observers thought would lead to a political federation between the three territories. The new organisation ran into difficulties because of the lack of joint planning and fiscal policy, separate political policies and Kenya's dominant economic position. In 1967 the East African Common Services Organisation was superseded by the East African Community. This body aimed to strengthen the ties between the members through a common market, a common customs tariff and a range of public services so as to achieve balanced economic growth within the region. The East African Community collapsed in 1972 following political differences between the member states.